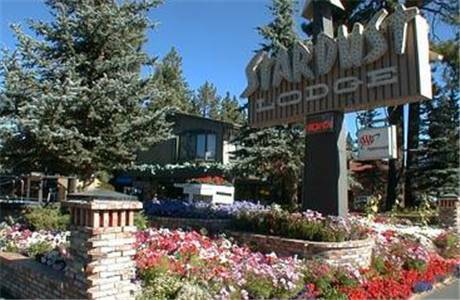 Stardust Lodge is directly across from the Heavenly Gondola 50 Square feet and a 5 min. walk to beach. Our year round Heated Pool is kept at a toasty 86 perfect for a refreshing dip after being on the slopes. We have a second heated outdoor pool in summer. The hot tub is 104 of relaxation and especially fun when the snow if falling. Stardust Lodge offers guests comfortable living as well as sleeping. The kitchens and kitchenettes come loaded with dishes plates cutlery cookware and small appliances to go with the refrigerator microwave and 2 burner electric hotplate or cooktop. Big screen TVs and DVD players are in every suite Free DVDs in lobby. Free WiFi is available in all suites. free- Wi-Fi Continental Breakfast DVDs Bike And Seasonal Equipment Rentals Private Beach Pass On-site laundry and Public Computer/Printer Coffee And Popcorn all day BBQ grills and outdoor fire pits year round picnic tables seasonal. Activity Center offers free daily hosted group activities to enhance your stay. Stardust Lodge is directly across the street 50 square feet from the Heavenly Gondola. Our ski-in ski-out location is also only a 5 min. walk to the beach free private beach access included in your room stay or the casinos. Stardust is on local shuttle/bus route across the street from movie theater shopping And dining. 1 block from casinos and ghtlife. Public parks beaches water sports hiking/bike trails horseback riding snowmobiling rock climbing within 15 min. drive. Stardust Lodge is directly across the street 50 Square feet from Heavenly Gondola. Ski-in ski-out location is also 5 min. Walk to the casinos or beach free private beach access included. Stardust is on local shuttle/bus route. For additional choices on your next vacation, check out the vacation rentals by City Concierge. You'll love the style and variety.